Panama is arguably Latin America’s most international destination. Thanks in large part to the Panama Canal, this tiny isthmus is home to populations from all over the world: Israel, India, Lebanon, China, France, Brazil, and Argentina to name just a few. So what is true Panamanian cuisine? The spicy, fiery flavors of the Caribbean? The seafood-rich diet of the Guna tribes? Or briny Mediterranean flavors dating back to the times of the conquistadors? When it comes to Panama’s signature dishes, the answer is: all of the above. Happily, in every town and region, there’s a tasty treat just waiting to tempt you. If you truly want to taste the Caribbean, try the Bocas del Toro archipelago. Here, restaurants serve up a variety of cuisines with a Caribbean kick. Most visitors stay on the main island of Isla Colon. But here's a little secret: a five-minute boat ride will get you to Carenero, where Cosmic Crab Cafe serves up mouth-watering conch fritters. For something a bit more adventurous try spicy pickled pigs’ feet. 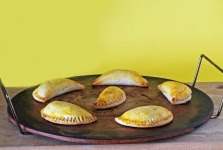 A party tradition stemming from Panama’s rich Afro-Antillean heritage, this treat known as saus is often served at parties, festivals and culinary fairs. A down-home cafeteria called El Sabroson serves up a slightly sweet version in the mountain town of Boquete. For generous portions and inexpensive fare, this eatery can’t be beat! A favorite for working guys and gals on the go, guacho fuses mild Latin American flavors with spiced meat or seafood. This “meal in a bowl” comes in dozens of variations, all building on a hearty rice base. For an elevated seafood version by star chef Mario Castrellón, head to Panama City’s Maito restaurant. Some guachos in Panama feature earthy pigeon peas or guandu. These tiny green and black legumes are highly nutritious and flavorful. They’re also the key component in another traditional rice dish: arroz con guandu. 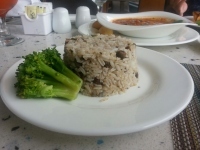 A simple “rice and beans” type dish, it relies on the guandu’s umami quality for depth of flavor. In island locations like Isla Grande, the dish is made with coconut milk for added richness. If you find yourself on this “big island” (so small, you can boat around it in an hour), head to La Cholita for an exemplary arroz con coco y guandu. Speaking of seafood, you can’t leave Panama without sampling some ceviche. Unlike spicier Peruvian versions, Panama’s take on this dish is all about the tart flavor of citrus. Locals “cook” fish, shrimp, and other types of seafood by soaking in lime. The marinated ceviche is then served with crackers or fried plantains. With a light Panama beer, it’s a perfect pre-dinner snack. Every town in Panama has a good ceviche spot. But at Panama City’s seafood market (Mercado de Mariscos) you can sample a range of different varieties. Panama’s most popular signature dish may well be corvina al ajillo. In this dish corvina, a light flaky fish, is lightly poached in a garlic and butter sauce. It’s a meal best enjoyed overlooking the Pacific. Head to the capital’s Amador Causeway, where restaurants like Al Dente serve it up with a side of patacones or fried green plantains—Panama's most beloved side dish. Locals say that the word Panama means “an abundance of fish”…and there are plenty more signature dishes you can sample from both oceans. But there are also many sweet and savory treats here that don’t come from the sea. Panama’s version of the cure-all that is chicken soup, sancocho is usually made with big hunks of chicken and starchy root vegetables. Some of these, such as the purple-hued otoe may be completely foreign to first-time visitors. But not to worry, they taste much like that other popular tuber, the potato. Where to get the best sancocho? The competition is fierce, so sample as many versions as you can …starting with El Trapiche Restaurant in Panama City. Panamanian tamales are moist bundles of ground corn filled with chicken and olives. If you think you’ve had tamales, think again. The Panamanian ones are very different from their Mexican counterparts, which tend to be more crumbly in texture. Though often served at weddings, tamales are also popular workday snacks. You can pick them up ready-made at local Riba Smith supermarkets. Better yet, find tamales and many other delicacies at Grand Deli Gourmet cafés. Once you’ve had your meal, try a little postre—that is, something to satisfy that sweet tooth. Unusual Panamanian desserts available at shops like Deli Gourmet include pesada de nance. A pudding made from the nance or golden spoon fruit, it’s an acquired taste due to its sour flavor. La Batea, a Panamanian-style restaurant in the Rio Hato beach district makes a “crème brûlée” version that takes this dessert up a notch. If you’re in the countryside, keep an eye peeled for little sweets referred to as cocada. A sticky mass of coconut and sugar cane juice, this decadent dessert has a rich, molasses flavor. Look for it at roadside kiosks or at Panama’s most famous outdoor market, in the crater town of El Valle. If you’re in the mood to sip a sugary treat, try a glass of chicheme. Made from fresh corn ground to a milky pulp, this drink is popular all over Panama…and even in Costa Rica. Not going quite that far? Make a pit stop at Quesos Chela en route from Panama City to Coronado Beach. A Panamanian institution, this shop in Capira usually has a line of locals out the door. Along with ice-cold chicheme, you’ll find soft curd cheeses, fresh baked empanadas, and much more.